The winter House of Delegates (HOD) meeting was tough with a lot of work going into changes which affect AAIV members. The most important change is updates to the bylaw regulating our membership in the Allied Caucus. There was much discussion, and everyone recognized the value the Allied Caucus delivers to AVMA through its diversity and specialized knowledge. Association policies are set by the HOD, and AAIV, through its HOD representatives, has a voice (vote) on policy changes. It is required that a percentage of AAIV members also be AVMA members to retain representation on the HOD. While requirements for AAIV to retain membership were reduced, it’s important to recognize that AAIV needs you to continue your AVMA membership. Having representation on the HOD allows AAIV to represent your interests, and the interests of your companies, to AVMA. The second change affecting AAIV members directly, is the increase in AMVA membership dues. AAIV did poll our membership, and a slight majority of AAIV members felt we should not support the increase in dues. As your delegates, we listened and voted to reject the increase in membership dues. Although the resolution passed with a majority HOD vote, our AAIV members can be assured that Dan and I, as your HOD delegates, are committed to a relationship of accountability and representation. 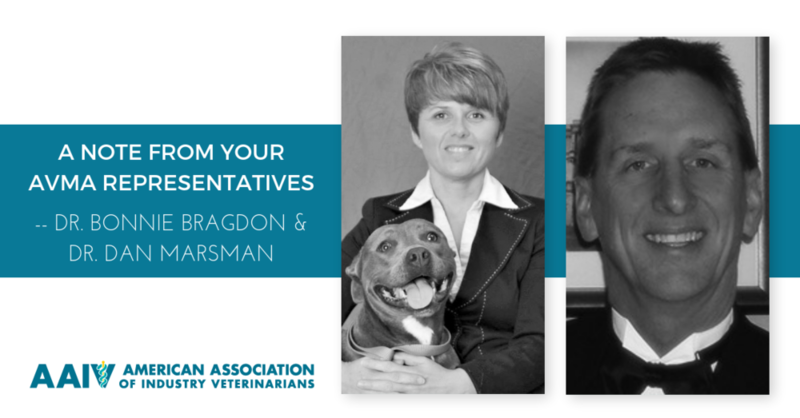 We commit to provide you information, listen, act on your opinions, and do what we can to ensure AVMA continues to meet your needs as a veterinarian employed by industry.